LOUISVILLE, Ky. (Dec. 17, 2017) – The late Ben’s Cat, four-time Maryland Horse of the Year and beloved equine hero, has been awarded the 2017 Secretariat Vox Populi Award, or “Voice of the People,” with record-breaking voter participation. The award, created by Secretariat’s owner Penny Chenery, annually recognizes the horse whose popularity and racing excellence best resounded with the American public and gained recognition for Thoroughbred racing. During Ben’s Cat’s eight-year career, which included three races in 2017, the 11-year-old multiple stakes winner finished in the money in 48 of his 63 starts, earning $2.6 million and widespread fan devotion that grew from his Mid-Atlantic base and spread internationally. Hall of Fame recipient and consummate horseman King T. Leatherbury bred, owned and trained Ben’s Cat, and together, their story of persistence and consistency delighted racing fans. While many of Thoroughbred racing’s stars emerge from the Triple Crown trail and other noteworthy stakes races, the beginnings for Ben’s Cat were rather humble. Leatherbury entered the then 4-year-old in a $16,000 maiden claiming race at Pimlico in 2010. 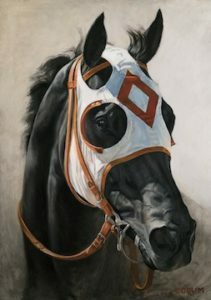 The dark bay gelding, who was of modest breeding and had broken his pelvis a couple of years prior, won that race — and he kept winning year after year, on the turf and the dirt, during a long and accomplished career that culminated this past June and boasted 26 stakes victories. He died just a few weeks after his retirement following complications from colic. Leatherbury, 84, who races under The Jim Stable, continues to train on the Mid-Atlantic circuit and has a career total of nearly 6500 wins. Ben’s Cat was one of a select group of nominees submitted by the Vox Populi Committee. In the online poll, thousands of Vox Populi voters from more than 50 countries showed their support by choosing the horse many simply called “Ben.” He joins a list of racing’s brightest stars who have also received the Vox Populi Award: California Chrome (2016 and 2014), American Pharoah (2015), Mucho Macho Man (2013), Paynter (2012), Rapid Redux (2011), and Zenyatta (inaugural 2010).